Is there a tech skills gap in the Sheffield City Region? Find out more in the podcast of my latest Business Live radio show, broadcast on Sheffield Live FM radio on 5 May. The programme featured Aldo Monteforte, CEO and co-founder of insurance telematics leader The Floow. Last week, The Floow was named winner of the Red Herring Top 100 Europe award – another trophy in the innovative Sheffield firm’s cabinet. Red Herring’s awards honour the year’s most promising private technology ventures from the European business region. Aldo explained why the Red Herring award has special meaning for The Floow, since Red Herring has a reputation for accuracy in highlighting innovation. The award came after a recent £13m investment into The Floow. Aldo explained the business’ plans to grow (from a current size of about 80 people, mainly based in Sheffield, of whom 70% are computer, data, and social scientists) to around 140-150 team members. What about skills in the Sheffield region? Can The Floow recruit people with the skills they need in Sheffield? Aldo says skills are here in the city region and in abundance. Have a listen to his views on how the firm will scale. Participate in the UK State of Social Enterprise Survey 2017. 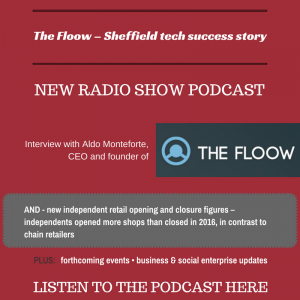 31:40 – 43:27 Aldo Monteforte of The Floow. Innovation, investment, growth, skills development. 43:27 – 52:37 more on skills – comments from Daniel Koseoglu, MD of recruitment firm Affecto Recruitment, about perceptions of a tech skills and talent shortage in the region. This comes in light of the recent tech round table organised by The Sheffield Star. What’s your view? And wrapping up. More about my Business Live radio show (which you can hear every Friday morning from 9-10am on Sheffield Live radio). Enjoyed this? Share it using the buttons below.